JEWELRY: We are the exclusive importer of the unique, colorful, and somewhat addictive line of jewelry by Frauke Lohr, a German artist whose work is sold in boutiques throughout Germany but nowhere else. 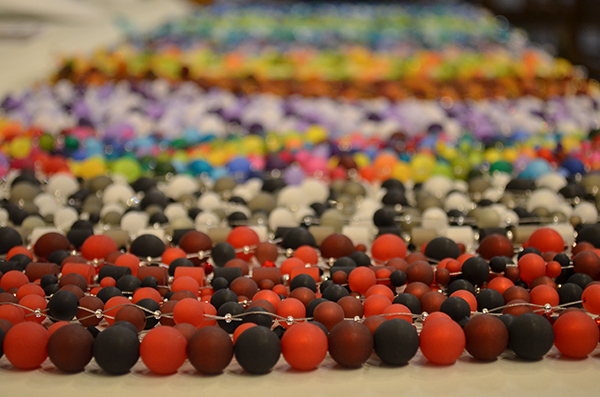 The line includes necklaces, bracelets, and earrings in a variety of styles composed of extremely cool-looking luminescent balls in a rainbow of colors. Necklaces are reasonably priced from $22 to $66; earrings from $8-$12; and bracelets from $15-$18. At the moment we are not selling these pieces online, and neither is anyone else—a great reason to come and browse our brick-and-mortar store! GIFT CERTIFICATES: Available in the store in any denomination, or call us at 224-999-7722 and we’ll mail one to your chosen recipient. Postage is free! BOOK-A-MONTH SUBCRIPTIONS: Want to make sure your wife always has the most fabulous new cookbook, or that your grandson has a constant supply of new chapter books to read? Sign up for this gift-that-keeps-on-giving all year round. Our staff pick out one new book-a-month within a specified price range and subject area/genre, which we can send directly to your recipient or hold for in-store pick-up. This is the perfect gift to help instill the love of reading in children, to delight the avid reader in your life, or to bring joy into the life of anyone with limited mobility. WORD CLOUD CLASSICS: This series features flexible, leatheresque bindings with imprinted “word cloud” designs composed of quotes and characters from each title. The books have a wonderful look and feel and every title is a true classic full of life wisdom and literary tradition. All Word Cloud Classics books feature the full unabridged text as originally published. ​LITOGRAPHS: Inspiring wall art created from the text of your favorite books. Just as the words on the pages of your favorite novel come alive in your imagination, Litographs are designed to illustrate the memorable characters and scenes rooted in text and imitated on stage. ENCHANTED BOOK BOXES: Enchanted Book Boxes make a wonderful gift for both writers and readers. These gorgeous boxes come in a range of designs - from Celtic to Asian, Classical to Modern, Medieval to New Age. They can be used as a jewelry box or to store valuables and souveniers away from prying eyes. OUT OF PRINT CLOTHING: Books, worn well. We carry a selection of t-shirts, tote bags, and socks from Out of Print Clothing. Each product sold donates a book to a community in need through our charity partner, Books For Africa. It also supports the authors, publishers and artists who made these iconic works an integral part of our lives. LEUCHTTURM 1917: Details make all the difference! Leuchtturm 1917 notebooks are manufactured with the highest quality materials and construction. A family business since 1917, Leuchtturm operates under the belief that the enduring values of quality, workmanship and attention to detail make for good products. More organized than a Moleskine, Leuchtturm 1917 notebooks have numbered pages, a table of contents, archival labels and come in a rainbow of colors. 2018 Diaries now in stock! RETRO 51: For over twenty years, Retro 1951’s mission has been to bring fashion, fun, and value to the world of writing instruments. They strive to bring the best quality designs to you by producing each product with the finest materials manufactured by skilled craftsmen. It is through constant evolution of style, color, and material construction that Retro 1951 proudly reminds you, Life is too short to carry an Ugly Pen! SIMPSON & VAIL TEA: The Literary Tea Line is a collection of blends that were created with a specific author in mind. The teas vary from black tea to herbal blends that come in handsome tins, or boxed collections. UNEMPLOYED PHILIOSOPHERS GUILD: Deep in the Ivory Tower, the Unemployed Philosophers Guild work day and night to determine the First Principles of Being. A collection of fingers puppets, witty mugs, groovy magnet sets, random mints, cool pins and much, much more. NORTHAVE CANDLES: What better way to relax then to light a candle and curl up with a good book. With North Ave's literary sented candles, you can experience your favorite books in a whole new way! From The Handmaid's Tale (Pomegranate and Red Tulips) to Where the Wild Things Are (Sugared Citrus and Island Greens) there's a scent for everybody, making them the perfect gift or treat for yourself! Coming in three different sizes, these candles are sure to light up any book lover's day!